Several exciting things have happened in the past couple of days... I sold my first tutorial on Etsy, I finished Alot v2.0, I managed to get the promise of free beads, just because I liked a company's facebook page at the same time as placing an order. Unfortunately, I didn't win the EuroMillions jackpot, but seeing as I didn't buy a ticket, I haven't lost anything either! 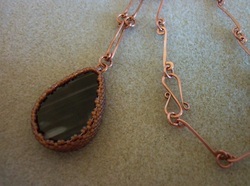 So in October 2010, I went to France with my Mum for a week to learn some wirework and chainmaille techniques at a little place called LaVidalerie, and I was asking Karen Sarll, the owner, how she went about getting her jewellery designs published in magazines. She told me it was easy, and all I would have to do was send a prospective email to a magazine, and they would say yes or no depending on whether or not they liked my design. I was so sure it couldn't possibly be that easy, but it turns out I was wrong! Either that or I was actually quite lucky. Now I'm not usually one for making new years resolutions, but I did this year, and I decided that I was going to try my hardest get get one of my designs published. After spending quite some time perfecting a technique for making beaded bezels for pretty stones, I sent a photo of a piece to a magazine called Beads & Beyond, asking if they would be interested in it as one of their articles. To my absolute astonishment, they were interested, and they would actually pay me too!! Well, the time has come, and the August edition of Beads & Beyond magazine has been published, and not only is my design in there, but it is mentioned on the cover! (oh yes, I rock!!) I've not seen the magazine yet, but the front cover is available to view here. The design that can be found in Beads & Beyond is for my beaded bezel ring/pendant... these are pictures of the pieces I sent them for their professional photographers to play with (I'm sure their photos will be better than mine!). 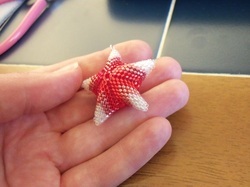 The "seeing stars" part of today's missive is in relation to a tutorial I bought yesterday, by the amazing Jean Power. She's a beader extraordinare, and we share the same love of geometric shapes in beadwork. 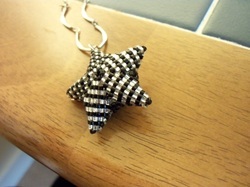 I bought her Geometric Stars tutorial, the design actually won awards when she first entered it into competitions. 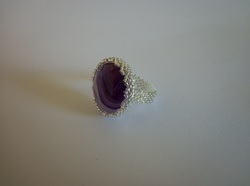 So I had a go at making a couple of these beauties, one in silver and black, the other in red, pink and crystal.